The fact is, many people out there would LOVE to own a standing desk! There are many health benefits that one can experience from using one of the products regularly, and above all, it means you won’t have to be stuck in a chair all day long! Many of these standing desks and desk converters are expensive, and once you’ve added all the custom keyboard trays, cable management options, adjustable monitor arms, you could be looking at a $2000+ price tag! We understand that many people would love to join the sit-stand desk community and have one of their own, but many are put off by the cost involved. That’s why we have put together this list of the best cheap standing desks that you can actually afford. And don’t worry, cheap doesn’t mean low quality. 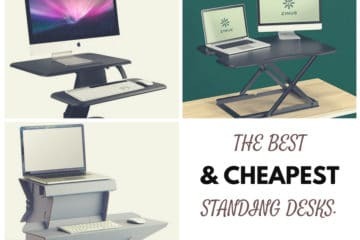 In fact, despite the low price tags some of these products even appear in our overall favorite standing desks, regardless of price! 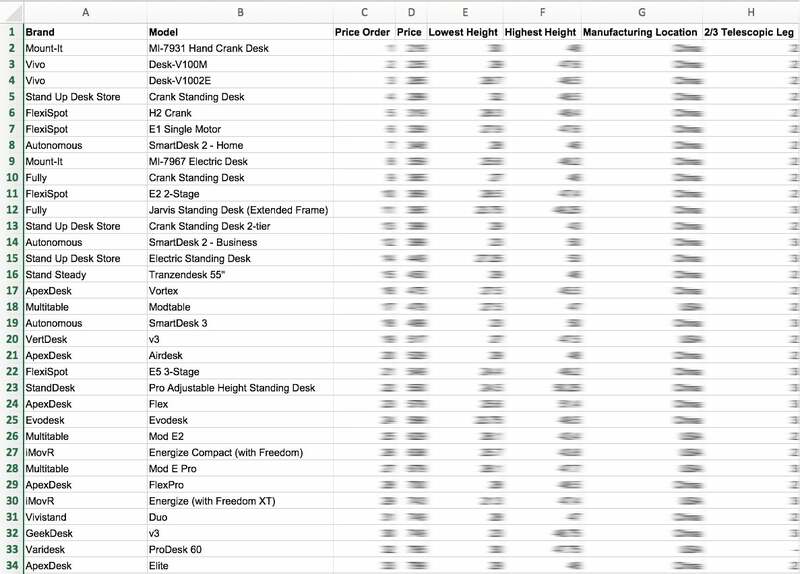 Anyway, enough about that, let’s dig into the details and find the cheapest standing desks! The first thing to point out is the very cheap price of the ErgoDriven Spark, by far the cheapest in our list. 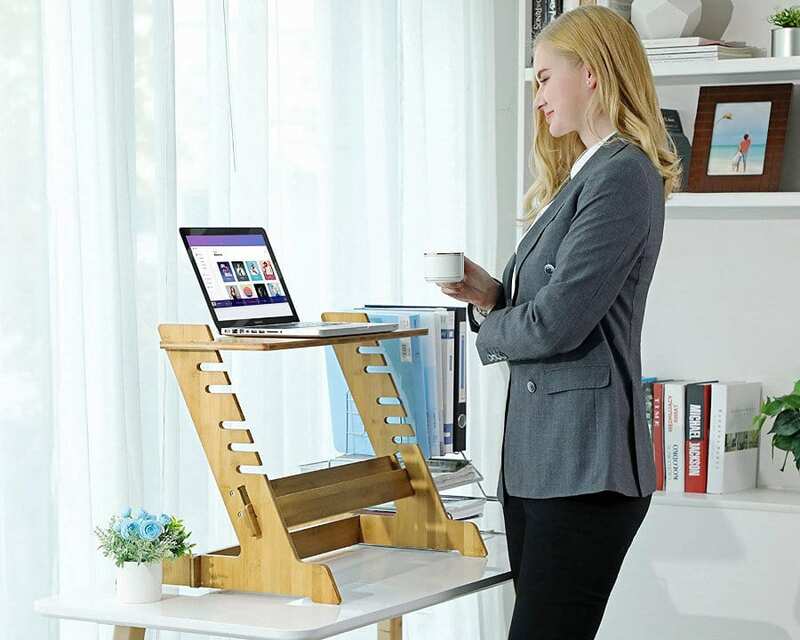 In the end, this is great if you want a way to get started using a standing desk, but are maybe a little apprehensive about jumping into the deep end with a $500+ product. As a starter desk, the ErgoDriven Spark will give you a great idea of what to expect, and even could end up being your full-time desk (a lot of people consider it more than sufficient). 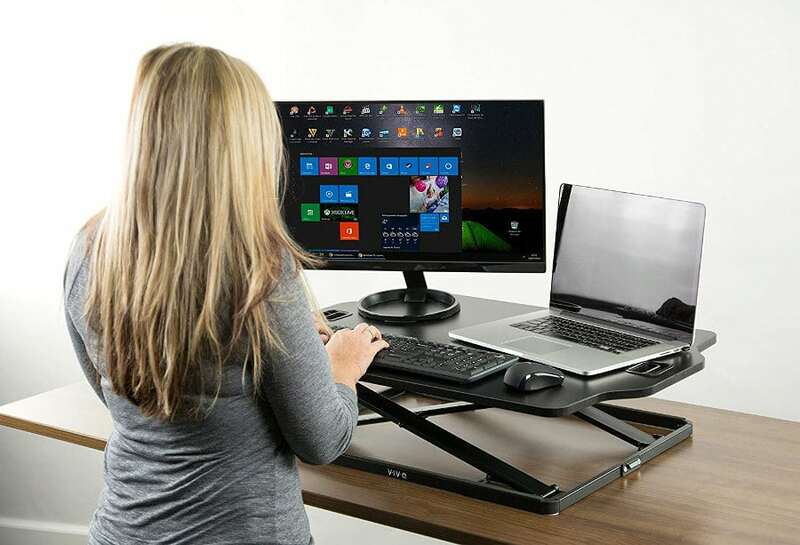 On top of this, it is probably the most portable and lightweight standing desk on the market. There are other products, known as laptop tables, that are also very lightweight and portable, but in general, they don’t have the same two-tier design of the ErgoDriven. This is great for simple storage and being able to use in different parts of the house or office. The design of the desk is also something to note. Despite being made of cardboard, and a “cheap” desk, this desk is far from cheap in quality. The Spark has two-tiers, allowing for separate keyboard and monitor placement, which actually makes it considerably more ergonomic than even some much more expensive standing desks. It also comes in 3 sizes which means that, even though it won’t be perfect for everyone, it will still be of use to a decent percentage of the population. As we mentioned, we see this more as a “gateway” product for testing out the waters, most users don’t recommend it for long-term (we’re talking years!) use. This product is well built and sturdy, so the product itself will definitely last long enough, but we imagine that most users will outgrow this product after some time. That being said, there are probably people out there that will find that standing desks aren’t for them, so making a much smaller upfront investment is a smart idea. The only other drawback that we’ve noticed with the ErgoDriven is that it is a fixed desk. Once you have is set up, you cannot adjust the desk height or keyboard height, so if this is something that is important to you, then you might need to have a look at the other products on this list. Once again, however, for the price you pay, adjustability should not be expected and this desk is great in almost every other way. The Vivo 32″ is the first desk in our list that looks like a more “traditional” standing desk converter. It is the classic design with a nice, large working surface, and handles that allow you to easily adjust the height with the aid of a gas spring lift assist. Most users agree that this is one of the most positive features of the desk, that it is very easy to adjust, the transitions are smooth, and the height-locking is secure. Considering this desk converter is almost half the average price of our best-rated standing desk converters, the product doesn’t skimp on the important details. It is obviously not the exact same quality as these other desks, but when you assess in terms of value for money then this product is still a winner in our eyes. One HUGE benefit, and something you might see in our other reviews, is the x-frame design. Although many people are impartial when it comes to x-frame or z-frame, we much prefer an x-frame as it means the desk will only move vertically up and down. Z-frames will move out towards the user, occupying more space and offsetting the center of gravity which can make it slightly (and only very slightly) less stable. In the end, and x-frame desk converter will take up less space, and most likely be a bit more stable. Last but not least, this desk comes fully assembled and ready to go. You don’t have to worry about a single screw, nut, or bolt! Among users, this really gives the Vivo 32″ a healthy rating boost. One of the main purposes of a standing desk is to improve your posture and alleviate pain. However, if you buy a standing desk that is not the right size for you, you are just as likely to suffer from posture and physical issues. The size of your standing desk depends completely on your height, and on your current desk height, that you must try fit within the recommended height levels. The Vivo 32″ is on the lower end in terms of height adjustment. It is more than enough for most people, but for anyone taller than 5’10” you will probably find that this desk doesn’t quite cut it. There are many tall standing desks however that take this into account and offer up to 22″ in adjustment. One other concern that users have is because of the single surface. Many people prefer having separate keyboard and monitor levels to achieve better posture and ergonomics, although this can easily be overcome with a monitor arm. Another reason to use a monitor arm with this desk is that if you prefer having multiple monitors, the desktop is not as large as other alternatives, and fitting two 25″ monitors on the desk may be a tight squeeze. Again, monitor arms are your friend here! 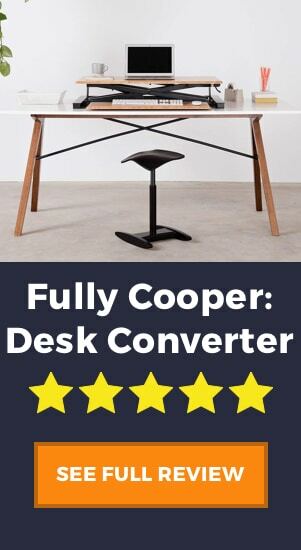 This product has a number of desirable traits, even though it is not what most people would consider your typical desk converter. As you can see from the photo, it consists of two outer stands that support two adjustable trays, one for the monitor, and one for the keyboard. The fact that these are adjustable gives you a lot of options when using the desk, adjusting the height of your monitor and the height of your keyboard independently of one another. Another positive feature is the simple setup of the desk. Since it is lightweight and portable, you can easily store it away when not in use, and when you do need it, it only requires putting the 5 pieces together a bit like a jigsaw. Once that is done you are up and running. One concern of this desk is its width. Many people these days like to work with a laptop and a couple of extra monitors, so if you’re one of these then we recommend looking at a wider product. The Songmics Bamboo desk converter is better suited for someone who just uses the one monitor or even just a laptop like you see in the photo. 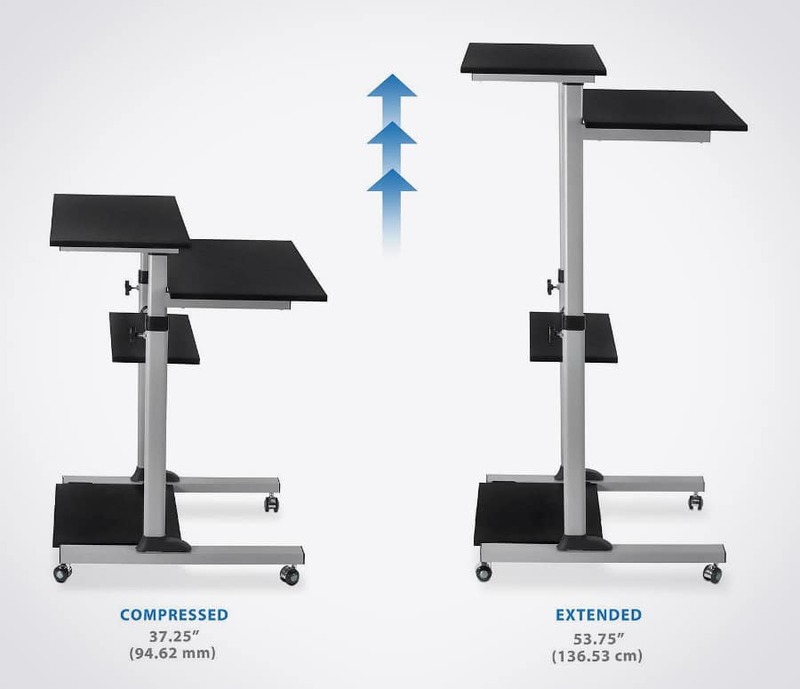 Additionally, the benefit of an adjustable standing desk converter is that you can move up and down with ease. This product, unfortunately, isn’t quite as easy as the standard products, as you have to physically remove and reset the “trays” at your desired height. This means that the adjustment is fully manual and also you must remove your monitors and laptops before making adjustments. If you are looking for something that is fully automized and can be adjusted at the touch of a button, we recommend you see what we think about electric standing desks. The Mount It! 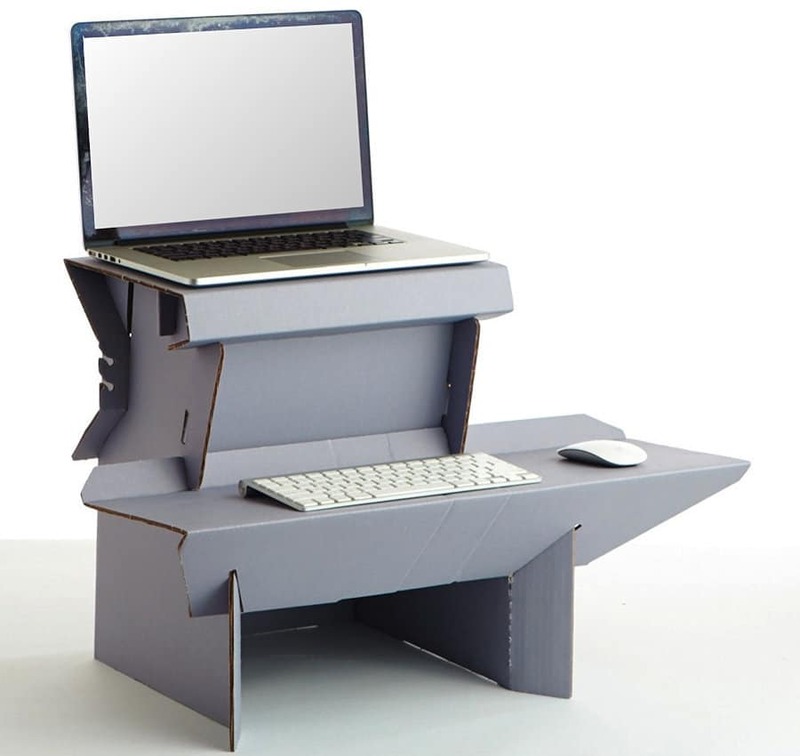 mobile standing desk is the first, and only, full standing desk on our list. That means, rather than sitting on top of your current desk, it acts as a full replacement. Although it’s not the prettiest product we’ve seen, it is definitely functional and cheap. Compared to other similar products the Mount It! is around a quarter of the price! It comes ready to use straight from the box, no assembly necessary. On top of this, it comes ready-mounted on casters (small wheels), which makes it very easy to move around. And don’t worry about it moving too much, these wheels also lock in place making a sturdy base for your workstation. Another thing that we, and many users, like about this desk is the fact that it has MANY shelves. Firstly, from an ergonomic point of view, you have the separate keyboard and monitor shelf, which allows you to stand in a better posture. These are not independently adjustable however which would have been a great addition in our opinion. From a purely functional point of view, the additional shelves are always handy in an office. There is plenty of room for extra storage for book, papers, and files, and you can keep these off your actual work surface. If you are wanting a full standing desk, this product is much smaller than a more typical standing desk. It is a lightweight product, that instead of being able to carry up to 300 lbs, can only hold 132 lbs (33 lbs per shelf). Once again, like the Songmics bamboo converter, this product is designed for people with fewer monitors or just a laptop. On top of this, there have been some user complaints about the wheels. Although many like the wheels because they make the desk easily portable, some people have questioned the strength and longevity of the casters. The casters in some cases have been faulty or worn out over time. 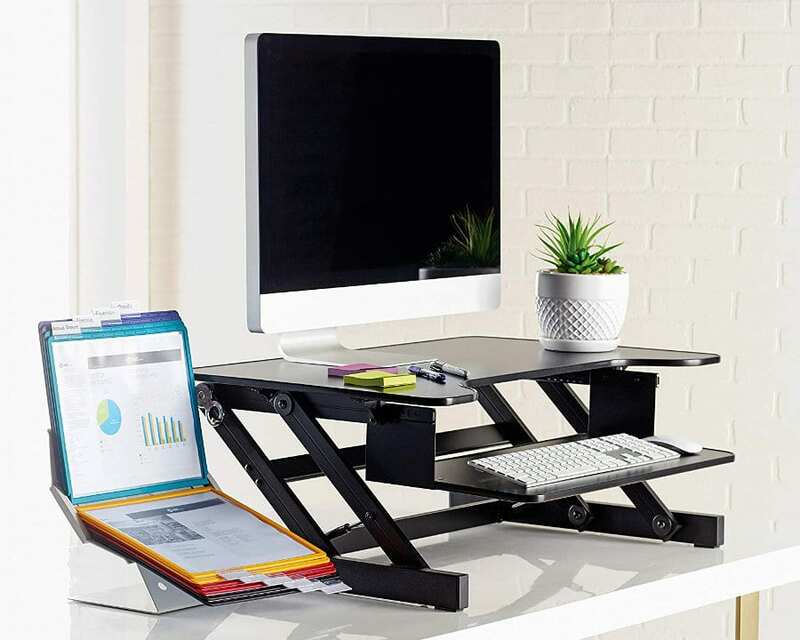 Probably the most impressive feature of the Lorell sit-to-stand desk riser is the fact that, even though it is much cheaper than most desk converters, it is one of the strongest standing desk converters available. With a maximum capacity of 50 lbs, the Lorell can support 10 – 15 lbs more than its competitors. In terms of design, it is large enough to use comfortably with two monitors, and it even has the much preferred two-tier design. Two tiers are more ergonomic, and also free up much more space on the desk surface making your work surface much less cluttered. Once again, like many other products on our list, the Lorell is ready to use as soon as it is delivered. If you don’t like the idea of doing IKEA-style work at home or in the office, with these ready-to-use products you will have no problems at all. 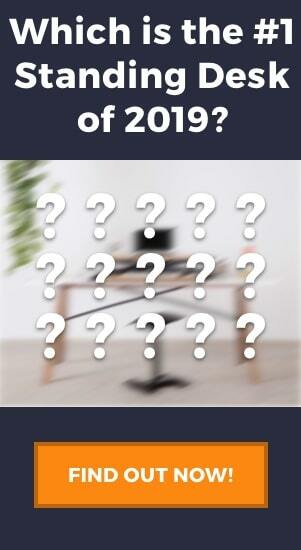 Although this desk is actually one of “Amazon’s Choices”, some people have not been 100% convinced. One issue is the keyboard tray. When in a standing position, the keyboard tray is perfect, but when collapsed (i.e. when you use the desk sitting down), the tray sits somewhat below the desktop. The issue with this is that to type, your hands are not as free to move, especially if your keyboard has a high profile. The other main issue is this desk’s frame design. Unlike the previous model we saw, which was an x-frame, this desk converter has the less preferred z-frame. As we already explained, the z-frame will move out towards the user as it moves up, taking up much more space in your home or office. If you have a large working area, this won’t be an issue, but people who are limited in space will probably prefer an x-frame for this reason. Standing desks have recently become all the rage, but some people were still put off by the high price tags and saw this as a bit of a barrier to entry. As time goes by, and the landscape gets more competitive, prices are coming down. But there are some products which stand out from the rest in terms of value, and we think we’ve got the best 5 here. As with many things in life, it will come down to personal preference. Each one of these products has its good and its bad, and it will come down to weighing your options. Do I need a large desk or a more portable one? Do I value design over function? Do I need a compact desk, or is my office big enough for a much larger product? These are the types of questions that can help you get started, and hopefully, soon you too will be enjoying the positive changes a standing desk brings to your posture, health, and well-being.